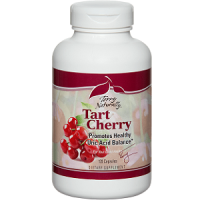 Terry Naturally Vitamins Tart Cherry Review – Scam or the Real Deal? 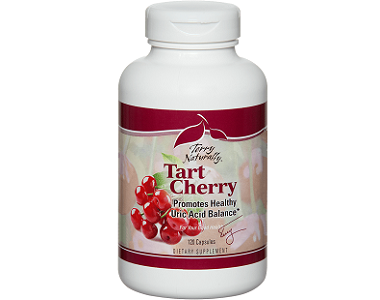 Today we review Tart Cherry by Terry Naturally Vitamins, a natural gout remedy. Gout is caused when your uric acid levels are too high. Uric acid levels increase when your body has to metabolize purines. Purines are naturally occurring compounds internal to the body, but are also found in gout-inducing foods included but not limited to: red meat, organ meat, alcohol, grains and ‘rich’ seafood products. Your gout symptoms therefore only abate as your uric acid levels go down, and the kidneys can process purines and safely discard of this build-up via your urine. You either have to omit purines or neutralize your uric acid levels. A known natural neutralizer is black cherry. Research has shown that black cherry reduces inflammation and uric acid levels in the body. High uric acids levels cause crystals to form in and around a joint. It causes a friction-like environment in the joint that is swollen and sore as well as inflamed. Additionally, they can lead to painful kidney stones characterized by swelling and redness. The crystals are usually broken down by the kidneys so they can leave the body as urine but this won’t happen if the kidneys are bucking under the strain of too-high uric acid levels. Tart Cherry contains anthocyanin, which are richly colored flavonoid cherry compounds packed with antioxidant capacity. They are also linked to correcting the uric acid balance in the body. Each capsule contains Tart Cherry (1,500 mg), containing 0,5% anthocyanin. The amount of cherry extract is quite good but the anthocyanin extract itself is slightly lower than what we have found in some other similarly formulated supplements. Anthocyanins are flavonoid compounds rich in antioxidants. They also help to balance uric acid levels in the body and optimize kidney functioning so that the kidneys and live can pass uric acid. However, the ingredients contained in this formula are a bit one-dimensional. A good start, but there are a host of other powerful soothing and cleansing agents which could also boost liver and kidney function. The kidney and liver need all the help they can get if you are a gout sufferer. How do you use Tart Cherry? Take 1 or 2 capsules twice a day. Ask for doctor clearance first if you are pregnant or breastfeeding. One bottle of 120 capsules retails for $35.95 on the product website and for $28.76 on Amazon. There do not appear to be bulk discounts. The policy is vaguely worded. You have to follow the processes of the refund policy to get your money back. But without telling you for how long this guarantee applies, you are left with a guarantee policy that is tenuous and without force potentially should you seek to enforce it. Studies have shown that Tart Cherry indeed helps restore uric acid to normal levels in the body. It is therefore highly unlikely that you won’t experience basic relief using Tart Cherry, especially if your gout is not that acute. The product gets average to good reviews. It would be remiss in this review not to point out that this is a one-ingredient (active, that is) capsule though. 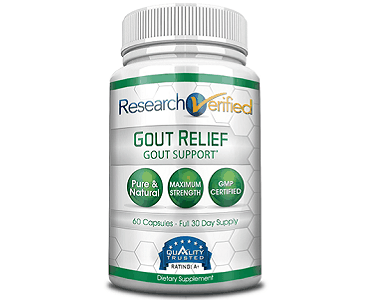 The question is – when your gout is at its worst and you cannot move or walk, will Tart Cherry neutralize that uric acid quickly and to the same extent as other more comprehensively formulated ingredient lists? We doubt it. The fact is, your body’s liver and kidney responses also need to be supported over all, and there’s no milk thistle or dandelion equivalent here. There is a good probability that over time, your uric acid levels will build up again as Tart Cherry is lacking total defense, cleansing aids that would combat the body’s stress response to having to break down purines long term.